08-Oct-2006 -- I was in Nevada for the annual National Council for Geographic Education (NCGE) conference. As 600 geography educators were gathered to discuss and learn about the latest geography education techniques, including field work and geotechnologies, it seemed only fitting that a confluence trek should cap off the events. For the past four years, I had attemped a confluence during each of the NCGE conferences, beginning with the ill-fated marsh slog that Shannon White and I lived to tell about, and ending with last year's woody hike in Alabama. This year would be entirely different: A Water Confluence. My colleague and friend Barbaree Duke and I had discussed visiting this confluence for several weeks leading up to the confluence. We had planned to visit it with Dr. Shannon White, but given the heavy presentation schedule that we were all under at the conference, we could not fit it in before Shannon had to leave the country. The only window of time we had was after my last workshop, fittingly, about GPS and topographic mapping, and before the time I needed to depart for the Reno Airport. This window was only two hours and 30 minutes long. Would it be enough to make a dash for the confluence? During the previous day, I had discovered via telephone calls that most of the boat rental companies were closed for the season. The exception was Ski Run Marina, which was luckily not far from the conference hotel in South Lake Tahoe. Not wanting to waste time walking to the marina, we took a taxi and arrived at 10:45am. However, it took quite awhile for us to be briefed on safety procedures and to check out the boat, and it was 11:30am before we actually set out on the water. Our boat was quite comfy, with a cover, a windshield, and room for seven passengers. I had never piloted a boat before, but fortunately, Barbaree was quite the expert. She soon had us quietly motoring out in the "no wake zone" toward the northwest--straight toward the confluence. After passing the last buoy, she moved forward fearlessly from the green shallow waters to the deep blue of Lake Tahoe. The GPS gave slightly over 4 miles (6.4 km) to the confluence. Obviously, on a water confluence trek, we were able to steer directly to the confluence. Lake Tahoe is a beautiful place for a confluence adventure. 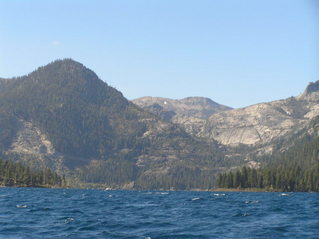 It is the highest lake of its size in the USA and is the largest alpine lake in North America. An average 1,400,000 tons of water evaporates from the surface of Lake Tahoe every 24 hours, yet this drops the lake level only one-tenth of an inch. The water is so clear that a white dinner plate is visible at 75 feet (23 m) below the surface. There are 63 tributaries draining into Lake Tahoe with only one outlet (Truckee River). The lake never freezes due to the constant movement of water from the bottom to the surface, although certain bays freeze usually once in a generation. The elevation is 6,229 feet (1899 m), is 22 miles (35.4 km) long by 12 miles (19.3 km) wide, and has 72 miles (116 km) of shoreline. Its maximum depth is 1,645 feet (501 m) with an average depth of 989 feet (301 m). This was truly one of the most beautiful confluence treks I had been on. After 30 minutes, we were only a few hundred meters away. Barbaree deftly maneuvered our boat to The Spot. I had great difficulty given the choppiness of the water to obtain a clear photograph of the GPS unit without dropping the camera and the GPS receiver into the lake. After five minutes, we were satisfied. We could clearly see every shore from the spot, and were closest to the shore to the northeast. The clear water was as beautiful as it is famed to be. The temperature stood at 55 F (13 C) under clear skies and a moderate breeze. I had been to 120 West only once before, in 2003, just one degree north of here. I had been to 39 North more than any other line of latitude, at least a dozen times in the central and eastern USA. This was my first water confluence since my trek on the English Channel to 51 North 1 East in 2004. This is a very special confluence. It lies at the "elbow"--the point in Nevada where the boundary changes from north-south to northwest-southeast. The California-Nevada boundary runs hundreds of kilometers from Oregon due south to Lake Tahoe along 120 West. Actually, as I discovered during my mountain climb to 40 North 120 West in 2003, the state boundary lies slightly to the east of 120 West. South of the elbow, the boundary changes directions and runs southeast toward Arizona at the Colorado River. Barbaree wanted to see the landscape toward Emerald Bay on the southwest shore of the lake, so we made our way toward these beautiful slopes. After 15 minutes, we took photographs and then took off for the marina. The change in our direction took us directly into the wind. We slowed and encountered some severe bone-jarring bumps--one of which caused me to exclaim aloud, as I thought my intestines were being shaken loose. One of the jars knocked the boat cover loose. Barbaree did a commendable job minimizing the worst of the body slams. We made slow progress toward the marina, but arrived at 12:25pm. We hastily checked back in with the staff, called a taxi, and arrived back at the hotel with 10 minutes to spare. A wonderful way to end our week of geography education! #1: View to the west-southwest from the confluence in Lake Tahoe, toward Emerald Bay. #4: Boat wake, looking northeast from the confluence. #6: Barbaree Duke and Joseph Kerski in self-portrait aboard the confluence boat on Lake Tahoe. #7: GPS reading at the confluence. #8: Our transportation to the confluence, from the Ski Run Marina. #9: 360-degree movie with sound filmed at the confluence (MPG format). In the middle of Lake Tahoe, about 2 mi from the eastern shore.